I've noticed something about sunfish. 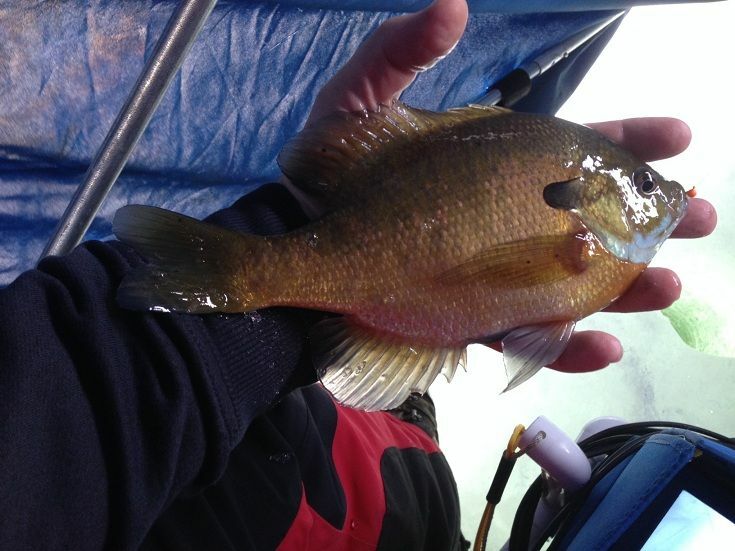 If you have a sunfish on a hook, it freaks out and dashes around. If you put your hand around it, keeping it in the water, it tries to get away. It does the same if you take it out of the water. But if you hold a sunfish underwater, tilted considerably to the side or held on its side, it flares its fins out and goes perfectly still. 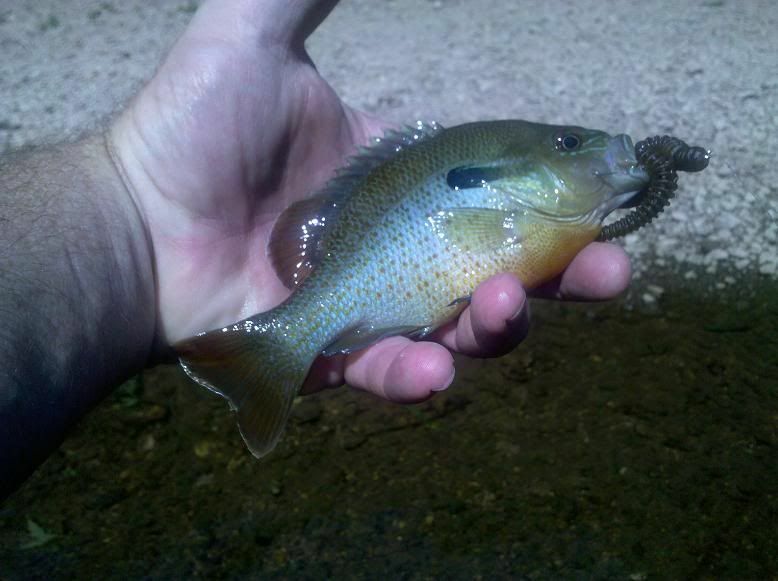 Out of 15 bluegill and longear sunfish I caught during one session (two people with fishing poles and one trap in the water), about 10 of them had to be handled for some reason. All of them showed the same behavior when gently tilted to one side. I didn't need to apply much pressure, I just had to gently cradle the fish about an inch below the water's surface, using my fingers as a bit of a cage to keep it from righting itself. 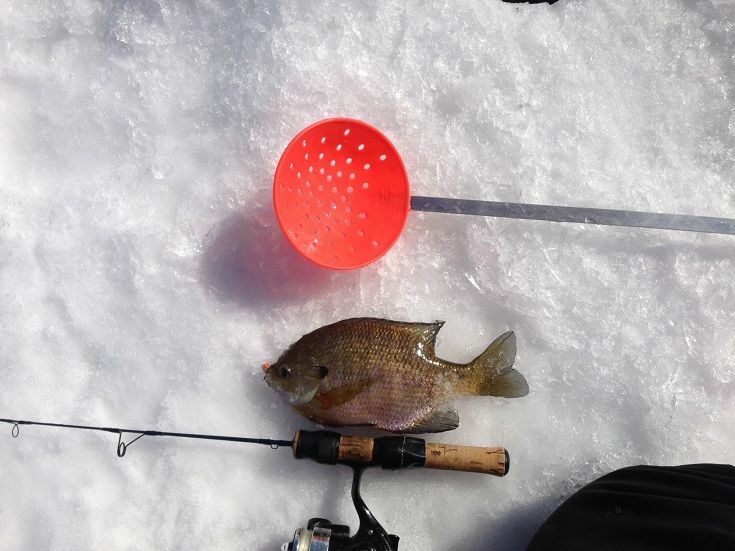 Aside from tentative little tail movements in an effort to get right-side-up, the sunfish didn't fight. I tried that on a big shiner I'd caught on a hook, and it didn't help much. The shiner kept flipping out. Do sunfish just get disoriented if you tip them sideways, or what? Is it a mouse-like "OMG, I'm caught, must play dead in order to not be interesting" reaction? Hmm, that's interesting. For me it's always about half way through a fight with a large sunfish that they start swimming on their side which makes them stronger fighters, the same goes with temperate bass when I catch them. On side, extend fins / spines, and lie still. Makes harder for some predators to swallow and reduces stimulus directing predator to further process. Sometimes predator confused when sunfish prey is very close but not mobile. Consider how predator detects prey, especially at close range. Yeah I completely agree with centrarchid. They stick out their spines and hold still as a last line of defense. They know they have been grabbed by your slight pressure and the spines sticking out makes them hard to swallow, most predators eat things whole and a big sunfish with erect spines will not go down easy. I agree also with centrarchid and smbass, but add that predators gullet's path of least resistance is maneuvering their prey into swallowing position, which in the case of sunfish, is on their side. Put that sunnie on the ground on a pile of wet leaves and it will flop again once it realizes it's free. Consider the latter two sentences concerning the fish not moving. Consider your response to a flopping fish in the water or on land. You are smarter than most aquatic predators so the fish not moving would not cause you so much confusion. Thanks for the vote of confidence about my intelligence. I'm smarter than an amoeba for sure. Yes, I agree with you 100%. I tried to provide an example, and apparently not a good one, that the behavior is due to the threat of being eaten, not merely because of it being on it's side. I assumed that the fish was responding to already being captured, regardless of being forced on it's side, and held albeit gently against it's will, hence the defensive response. But, when the hands are lowered and the fish more vertical, there is a sense of freedom akin to being released, and thus not motionless any longer. But that had me wonder, why does the fish not see the threat any longer? The fish is still constrained somewhat, with a predator (human) still in plain site. Does the fish not recognize the entire human as the predator, or only the hands? Ah, that would make sense. So it's a reaction of "Oh no, caught! Must... make... self... hard... to... eat..." when they're on their sides. Or perhaps to avoid being caught...motionless, stiff, spines erect. 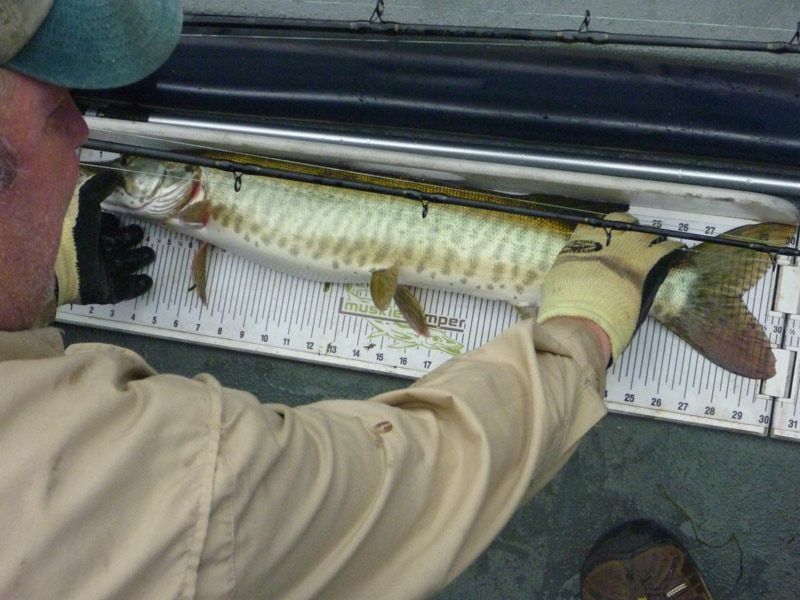 Maybe a deterrent to a predator that may have had a prior painful spiny fish ingestion attempt! And this makes sense too. In an aquarium or in a stream, I've experienced, when spooking a fish (bass or sunfish), that the first reaction of the fish is just what centrarchid describes...right before swimming off in a hurry! I was thinking about this last night and recalled similar behavior when fish were removed from the water (I know that betta's example was for fish in the water being restrained gently). I also found pictures of fish posed on the ground that remained motionless. But I also recall that fish don't always cooperate as now and then they are no so photogenic and leap to escape (either out of the hand or off the ground and back into the water). But, it isn't always instantaneous either. 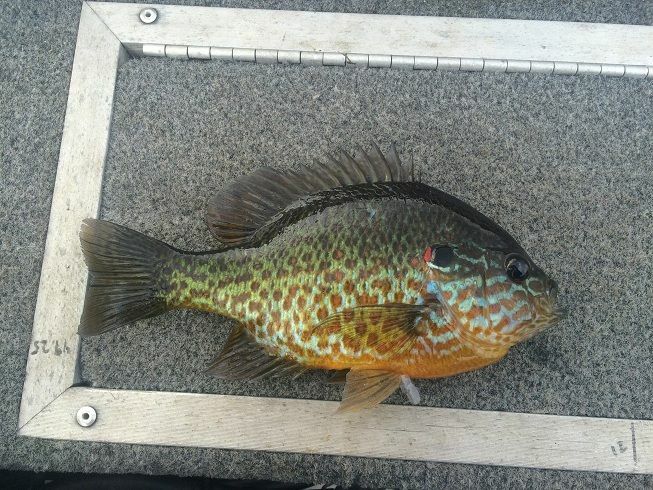 And it's not just sunfish, could be any species. Maybe there is something about their sense of balance that causes them to lose awareness, yet the defensive mechanisms remain? I have many examples of posing motionless while in my hand after being caught. Sometimes I've held them flat, others at an angle. Most of the time they are motionless and fins erect. But, there are some that don't cooperate as well. 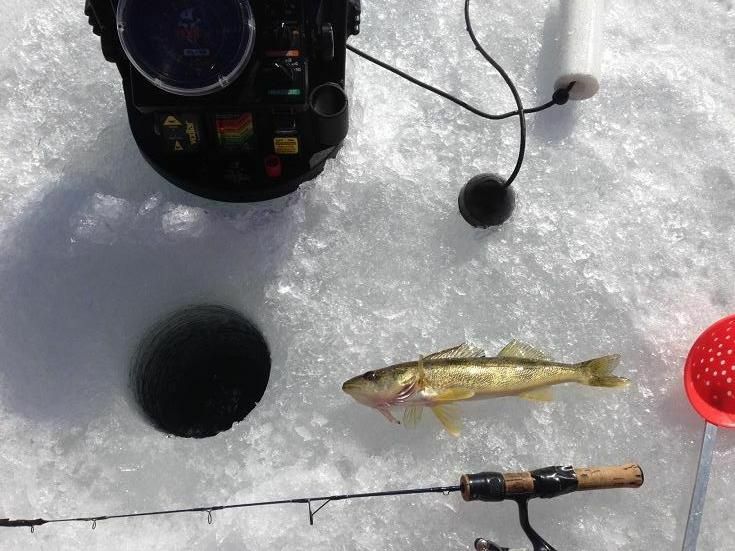 Also, this happens if you lay them on the ice, ground, or in a net for a picture. 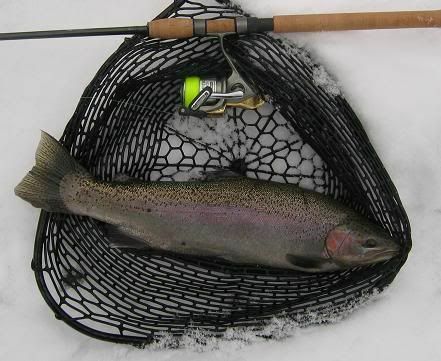 I've done that for trout too. Anyway, if they are calm enough to allow a photo, usually after several seconds they attempt to escape usually. So why do they do this? I think it's for the reasons mentioned above mostly, but also other factors on game fish might come to play, like being tired from the hook and line fight, being out of their environment is something they aren't used to either, and maybe even no water flowing through their gills? 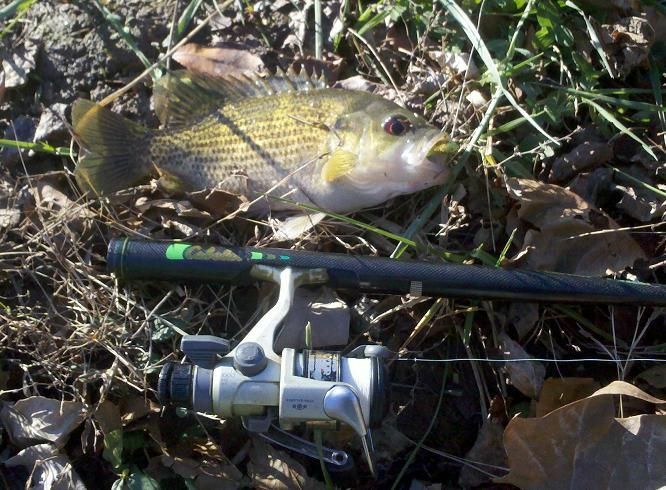 Here is a rock bass exhibiting the same behavior but on the ground. 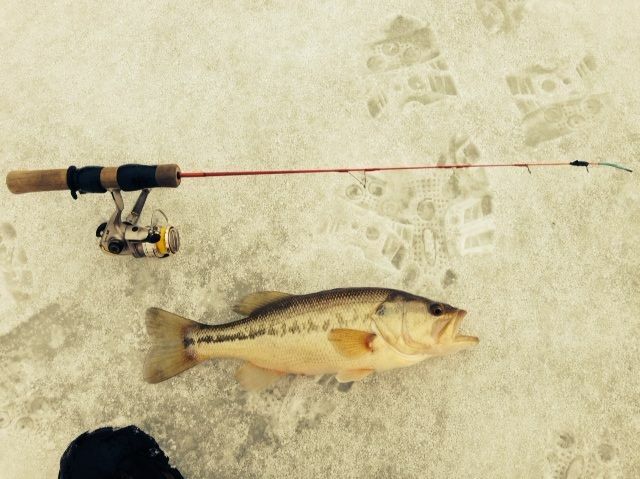 Here is one posing on the ice.